Peppernuts (or Pfeffernusse Cookies) are a traditional German cookie often made in Mennonite communities in the US. They are a highly addictive, tiny, crunchy cookie filled with warming spices and are perfect for gift giving during the holidays! 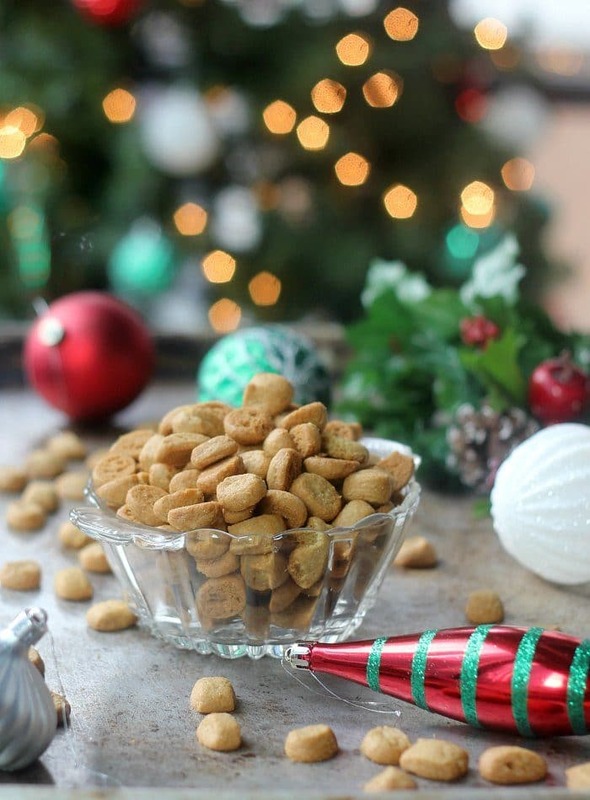 Growing up in Kansas, there was one particular cookie that was a staple at every holiday event: Peppernuts. The area where I grew up (Hutchinson, KS) has a fairly large population of German Mennonite and because this is a traditional German recipe, these addictive little cookies are very popular during the holidays. 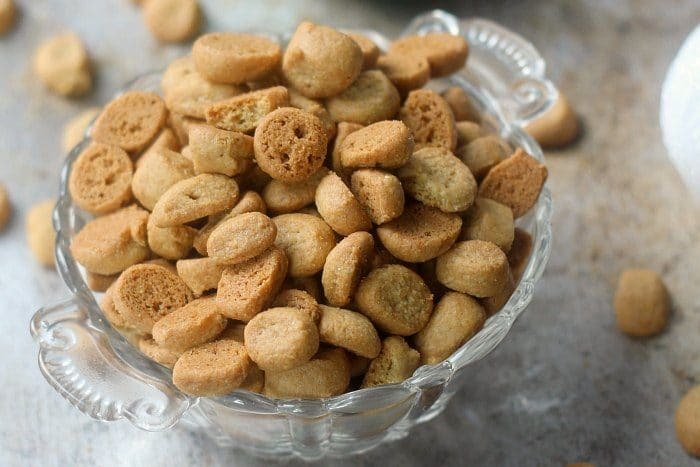 Peppernuts, also known as pfeffernusse cookies and very similar with Danish pebernodder cookies, are a tiny cookie about the size of a nut (this is where the name comes from) that are filled with all kinds of spices. The cookies are crunchy and flavorful and eaten by the handful. It is really hard to stop eating them, once you start. You are warned! My family in particular did not make these amazing cookies, rather we would often receive them as gifts from various other people. The cookies from each person we received them from would have a slightly different flavor, and I personally loved them all. It seems each family’s recipe has a different variation on the spice combination, and in talking to friends from my hometown who do have family recipes, they are quite opinionated and passionate about what should go into them! The one main ingredient that seems to have a general consensus from the group is that anise (most recipes use anise oil) is an absolute must in a true peppernut. Beyond that, most recipes use ground cinnamon and ground ginger, and then others add various combinations of cloves, allspice, nutmeg, and some use ground nuts or nut flour. One ingredient that I was surprised wasn’t a unanimous “absolutely yes” from the group, is the use of white pepper in the cookies. I have always added it to mine and had believed this is where the cookies got the “pepper” part of their name and really what makes them so unique and special. But I learned that this ingredient is also controversial. About half use pepper and half do not. I am very much on Team Pepper in these special little cookies! One of the other special things about these cookies is that they keep for a REALLY long time and the flavor actually keeps developing, getting better and better. In researching these cookies, I learned that traditionally these cookies were made about a month before Christmas and kept in metal tins to “age” before the holidays. I am FOR it! The makeup for these cookies is very simple. The dough is a pretty standard cookie dough where the butter and sugar are creamed together and eggs and flour and leavening are added. I prefer to use dark brown sugar in these cookies because I love the color and flavor the extra molasses in it brings, but light brown would work as well. And then you just add your lineup of spices and extracts. I think this is one of those recipes that you can definitely play with the flavor combinations to find your favorite mix. I love to add cardamom to mine! This definitely isn’t traditional but the spice contributes such an interesting herbal citrus note that I enjoy. The dough is chilled for about 30 minutes and then rolled out into little ropes and cut into tiny pieces. This might seem tedious, but the whole process actually goes pretty quickly and this is such a fun thing to do with the family. You can even get your kids in to help roll out the ropes. No need to worry about each cookie being exactly the same size. The inconsistencies is part of the fun of these cookies! One of the other amazing things about peppernut cookies is that this makes about 12 cups of tiny little nuts. They are perfect for splitting up into little bags and tying with some ribbon to give out as gifts! I truly hope you give this unique little cookie a try! I have no doubts they will become a fast favorite made year after year! In the bowl of a stand mixer fit with a paddle attachment, or in a large bowl with a hand mixer, cream together the butter and brown sugar until light and fluffy. About 3 minutes. Add the eggs, anise extract, salt, baking soda, cinnamon, ginger, white pepper, and clove or cardamom into the bowl and mix until everything is incorporated. Add the flour into the dough and mix just until it is incorporated. You do not want to mix for a long time, just until the flour is incorporated in. Chill the dough in the refrigerator for at least 30 minutes and up to 3 days. Preheat the oven to 350F (177C). Divide your dough into 8 pieces. Press 1 piece of dough into a ball and roll it out between your hands and a clean work surface to form a thin rope, about 1/4" thick. Use a sharp knife to cut out tiny nut size pieces of dough. Place on a baking sheet. You can completely fill your sheet in a single layer, but you will need to bake these in several batches to get them all baked. It typically works out to be cutting out the next sheet pan of cookies while the one before it bakes. Bake at 350F (177C) for 12-17 minutes, until a dark golden brown. Check the cookies at 12 minutes and bake longer if needed. The cookies will be slightly soft when they first come out of the oven but will become very crispy as the cool. Store the completely cooled cookies in an airtight container at room temperature for up to 1 month. This dough can be made up to 3 days in advance and stored in the refrigerator until you are ready to bake. These cookies keep a very long time, up to 1 month, and the flavor keeps developing. Make them far in advance of your holiday party or for gift giving! If the dough is too sticky to roll out, let it chill for longer and add a little bit of flour to your work surface while rolling them out. Never heard of these but they look and sound great! They are really popular in Kansas. A staple at Christmas and so yummy. Because I hail from German ancestors I chose to make these Peppernuts. I quite like them! They take an incredibly long time to make and it was hard for me to actually get them small enough. Even so, I’d do it again and I’d like to try the cloves rather than the cardamom, only because I’d like that little more pop of flavor cloves offers. I did like the cardamom. The only thing wrong on the recipe was the time. It’s 5-7 minutes and NOT 15-17 minutes to bake. I’m sure it was a misprint. Hi there! So glad you enjoyed these! They are definitely my favorite. The baking time is not a misprint, I have made these time and time again. This amount of time, assuming your oven is not heating too hot and you are making them about the size of a hazelnut, is the amount of time that will get them really crunchy. So glad you liked these! I grew up in kansas too funny when i google peppernuts i find a recipe from a fellow Hutchison native. YES! Many people tell me this! So glad you found my recipe! Merry Christmas! These look so good, I’ve never seen them before. I think I’m gonna make them soon! Thanks for the unique recipe. Let me know how you like them! Be prepared to eat rediculous amounts of them. They are sooo addicting! I am gonna to try these. One guy was telling me that he had craving for pepper nuts, he also said that they are so addicting you can’t just have one. Went to a bulk food store and asked the clerk if she ever heard of pepper nuts. She said, No. Today I searched google look so good and easy I have to try. My plan for Christmas this year. But 600, holy. HAHA! They are so tiny! These will come out slightly crunchy. They are a little bit fluffy when they are fresh, but as they age they get crunchy which is the way I have always had them! So great to hear Cortlynn! Thank you! From Kansas and love these cookies! My mothers w’ould bake them when I was a child growing up in the Wichita area. Now she is passed and I miss the cookies so I need to find a EASY one . I am 56 and do not cook much so the easier the better. This one looks to fit the bill and sounds the way she cooked them. Memories for sure. Thanks! Hello from a fellow Kansan! Let me know if you try them and how you like them! I always think they get better with age! Donetta Powell—my family all lived and grew up in Kansas. They came there from Germany and Austria. I’m sure many folks did, that’s why I’d bet these are popular in Kansas. Let me just say that the very best years of my childhood were the ones spent living in Kansas out in Hodgeman County and Ford County. I missed it when we moved at age 13, I don’t think I ever got over it either Oh, these Peppernuts are really good!!! Hi there! All of the ingredients are already listed by volume and by weight in both ounces and grams! Let me know if you have any questions! Not the pepper nuts I am use too. These are dry and flaky like a sugar cookie. Did my family recipy and this one. This one did not make the snack table… this one needs more liquids to make a sticky dough. Try honey, karo, or milk. Hi Matt, I wonder if you ended up with too much flour in your dough. Make sure not to pack it down at all when measuring it! This particular recipe does not need honey or cornsyrup or any extra moisture! I love that Becky! I hope they loved them! -First, I need to apologize for the length of this post. -Our family has been making a version of these for generations. I remember when I was very young we would receive a box of these from my maternal grandmother every Christmas. She passed when I was about 8 and all her children were bequeathed the recipe. Each would send Peppernuts to their extended families until they passed, then the recipe would be passed on and so on. Well my mother didn’t continue the tradition but one Christmas when I was a teen she decided to make them to send to my sister as well as have some at home. She made the dough and the next day Dad and I baked them. It took us a good part of the day for I swear we made at least a few thousand. We continued the tradition until Dad passed and I wasn’t able to go see Mom for Christmas. By that time my Sister had decided she couldn’t be bothered with making them and Mom was getting too old to manage it on her own. -Unfortunately , when Mom passed she neglected to put the recipe in her will and she was the last of her siblings. Well, Sis has had the original for years from our Grandmother but doesn’t seem to want to send it to me (or has lost it). Sis is now 80 and I am in my mid-60’s. I would love to restart the tradition for some of my second cousins. The difference is tat I will send the recipe when I send the cookies and not wait until I pass. I don’t want the tradition to die again. -Since I don’t have the original recipe I have been searching for a reasonable facsimile and I believe this is it. -Thank You Baker Bettie for your part in the restart of a family tradition. Thank you for sharing your memories with me Jennifer! I’m so sorry to hear that the recipe did not get saved. I hope you and your family loved these! And then there are those of us who can’t STAND the taste of anise or black licorice. But I appreciate the enthusiasm! That is the beauty of a recipe in that it is only a guideline! You can always change the extracts and spices to meet your own preferences. I have made these a few times when I didn’t have anise extract on hand and they are just as tasty, just different! Make them your own! I just left it out! I didn’t substitute it with anything. With all of the other spices they are still very flavorful that way! But you could use vanilla or almond extract if you want to add something. But I would reduce the amount to 1/2 tsp if you use almond extract. I thought about substituting Almond extract, but I usually make it with Anise. I’ll let you know if I try it with a batch. ok I can def see how these would be so addictive!!! Phefferneusse are one of my favourite childhood Christmas memories. My Oma and Opa (who were Mennonites in Canada) would make pails of them (storing them as you described in metal tins). Whenever we would go over we would usually leave with a small bag of them. Their tins would usually last until Easter. A few years before my Opa died I decided to try making them and was able to pick his brain and get his tricks for making them. His (my) recipe uses shortening and honey + baking soda, sugar and spices. . The full sized recipe has about 16 cups of flour, 1 lb of shortening and 2 lbs of honey. It takes me about 8 hours to roll all the logs and bake them. A long time, but it’s 8 wonderful hours of thinking of them and recalling wonderful memories. I have to Say that walnut flour blend, honey and butter make the best & most traditional pfeffernusse. I will try aging although I don’t care for crunchy cookies that aren’t easy to dip into tea. I tried these from German family but they are originally a Dutch recipe that was made to show off the many pricey and exotic spices brought from the new Spice Trade & gifted at Christmas. I love hearing everyone’s own experiences with peppernuts. They bring back so many memories for everyone! Ok, so giving these a try with the kids and I’m not sure I got the dough quite right. It was pretty sticky to handle and then 15 minutes in the oven seemed a little too long (my wife says overly caramelized, I say burned). Am I just not chilling long enough? Is there something else I may have missed? I checked and rechecked the amounts and I’m sure I measured everything out right. Still tastes pretty good, though! It is possible that you may just need a little more flour if they are still sticky after chilling. It can vary from day to day and based on where you live. You can lightly flour the countertop if needed when rolling them out, but it is a little bit of a sticky dough. Possibly your oven cooks a little hotter than mine and you may need to adjust the baking time a little bit less! Our recipe calls for dark karo syrup and shortening and milk vs brown sugar and butter…I guess the more economic way to make them! Boiled these first ingredients with sugar and after cooling begin adding the rest. I shall give your recipe a try! Thanks for sharing your families tradition with me Adriana! Aren’t they just the best? Merry Christmas to you! I was looking for a recipe close to home (Hutchinson, KS) and was surprised to find a fellow baker from my hometown! I am excited to make these for my children and parents as these are hard to find here in Arizona. Thank you for sharing and bringing a bit of home to our holidays! Hi Sherry! Hello to a fellow Kansas baker! I hope you and your family enjoy these nostalgic cookies! They are one of my absolute favorites! I made these this morning and they have no taste al all. I know I didn’t leave anything out and my spices are new. I was going to just use the dough with some additions and make cut cookies, but they were so dry, didn’t want to waste any more ingredients. I did however try a short cut in cutting them into “nuts” I used my cookie press with the three hole disk. Dragging along as clicking about twice to make “worms” and then cutting into small pieces. Thanks tho for giving me something new to try, not everything works out. I live in Lawrence but was born in Hutch! So sorry these didn’t work out for you. I am very confused that you would find them bland, as they are quite a spiced cookie. The flavor does develop some after some time, but even straight out of the oven they have quite a lot of flavor. I’m wondering, since you mention the dough being very dry, if you possibly over measured your flour? You want to lightly spoon the flour into your measuring cups, without packing it down, and level it off. It is common to accidentally pack too much flour into your measuring cup. Brilliant idea to use your cookie press to make the ropes! I too am from Hutch and live in the Pacific Northwest now. I bought some store-made peppernuts and was horrified by the giant, frosted incorrectly spiced monstrosities that I found when I opened the box. I really appreciate your posting of the “real” recipe! Hello to a fellow Hutch native! Let me know how they turn out! We are keto, could I use all almond flour for this recipe? I’d you Sukin Gold for the brown sugar. Would the flour ratio be the same? Kansas here also KC area. I have never made this with only almond flour and no wheat flour. It should be about equal amount, but I would add most of it in and then check the texture of the dough and add more as needed. It should be a slightly sticky dough, but still pretty thick. Let me know how it goes! We are keto too. Did you happen to try an alternative version of these and did they work? I grew up in Haven, and the influence of my Mennonite friends and the Amish in Yoder meant we had great foods including bierocks and peppernuts. My Grammy made these for Christmas when I was a kid. I’ve been searching for a comparable recipe. This one seems to be the closest yet especially since she was from Kansas. Anyway…I had to make a few minor alterations (half anise n half pepper to be on safe side due to Bf’s tastebuds). I wish I hadn’t because I think they’d be spot on to hers! So next year we’ll go full flavor & cool earlier. One question though….I’m not sure if I got the dough consistency right. We couldn’t mange to roll out “snakes” without it wanting to crack. But the dough isn’t dry either. Regardless So they still came out great! Awe, I’m so glad you found these, Jen! I’m sorry you had a bit of trouble with the rolling but thrilled to hear you enjoyed them nonetheless! Such fond memories of my grandma at Christmas time in Abbyville Kansas making peppernuts and home made taffy. Just seeing a picture of these takes me back. Been wanting to make these for years. A little late this year but will start thanksgiving time next year. Great idea, Bruce! Hope you enjoy them for years to come! My German grandmother made thousands of these. She kept them in Tins in back hallway and gave as gifts. We would devour them. Even as little kids we dunked them in coffee and yes, they are addictive! I don’t do the anise but this is the recipe! I love that story Donna! What great memories! I have made them without the anise before too and they are still fantastic! My grandparents lived in Lyons, Ks. They ALWAYS had these for us kids. My grandmothers brother made them. His recipe passed with him. And my grandparents have now passed too. BUT with this recipe I get to start up the tradition again with my daughter (here in sunny SoCal). But trust me, pfeffernüsse, and specifically this type, will always have my heart in Kansas. Thank you again…you restored a bit of one of my fondest childhood memories! That makes me incredibly happy Jennifer! Let me know if you make them and how it goes! Happy new year to you! I grew up in Kansas and I think I was 25 before I ever heard of these. Somebody brought them to a work Christmas party. From your description of the texture, I don’t think they were done right. They were as hard as nut shells. That combined with the anise kept me from ever wanting to try them again. I saw in your recipe to leave out the anise if you don’t like it and they are supposed to just be a little crispy. I’m tempted to try them! But still, nearly 40 years later, I’ve never seen anybody bring them to another party. Weird that they are apparently iconic Kansas. Hi Lana! I’m curious what part of Kansas you grew up in. My husband’s family is from the Lawrence and Kansas City area and they aren’t familiar with them either! I think it is more of a rural Kansas thing! Hi Crystal! Brown sugar has molasses in it. And dark brown sugar has more molasses in it than light brown sugar which is what I’m referring to. While molasses by itself is not in the recipe, the brown sugar will add some molasses flavor. Hope that helps! Enjoy! My son needed a German food to take to his German class on Culture Day. Pfeffernusse came to mind since we ate them growing up. My Mennonite grandmother would make them and I remember making them with my mother as well. I found this recipe and also asked my mother for her recipe. She had two recipes from two different people, but they were very similar. Both called for molasses or dark syrup and for sour cream. Since I did not have dark syrup on hand, I decided to make this recipe. I did not over measure the flour, but found the dough to be very dry and I had a terrible time rolling out the dough. It kept cracking and wouldn’t bind together. I just kept working with it and then cut it. Towards the end, I poured in some sorghum to bind it together a bit more. The nuts were good, not overly spicy, and my son loves them. I think we will try the other recipe next and compare. Thank you for sharing. Hi Lori! So sorry to hear that you had issues with the dough being too dry. I make this several times a year and have not had that issue! Do you live somewhere that is very dry? Flour can be so temperamental. Glad to hear they were enjoyed even so! Thanks for the feedback! I was interested to find your recipe. Just went through our family recipes and my Great Aunt has a recipe. She also uses cardamom but also uses citron. She was Danish and lived her entire life in Osage City, KS. She also rolled her dough into what she called “pencils” and cut them into small “nuts”. I know she used black pepper as I remember the black “specks” when I was a kid. Keeping your recipe at hand to help. There are some notable differences. Hi Niki! I haven’t found anyone else who uses cardamom in theirs. I really love what it adds to the flavor. I love seeing everyone’s version. They are all quite different but result in the same idea. Happy holidays to you! I too was from Hutchinson, KS (Graduated HHS 71) and used to make these every Christmas holiday! These were a family favorite for sure. The only thing I didn’t like, was it was sooo time consuming to roll out snakes, cut them, then roll them to pea size, THEN bake them. It did make A LOT of little bite size cookies, but everyone would get a handful and pop them in their mouths and I’d think how long it took me to roll that handful out! LOL I used to put them in mason jars, tie Christmas decorated fabric on lid and give them out as Christmas presents! They were a big hit! Hi there! 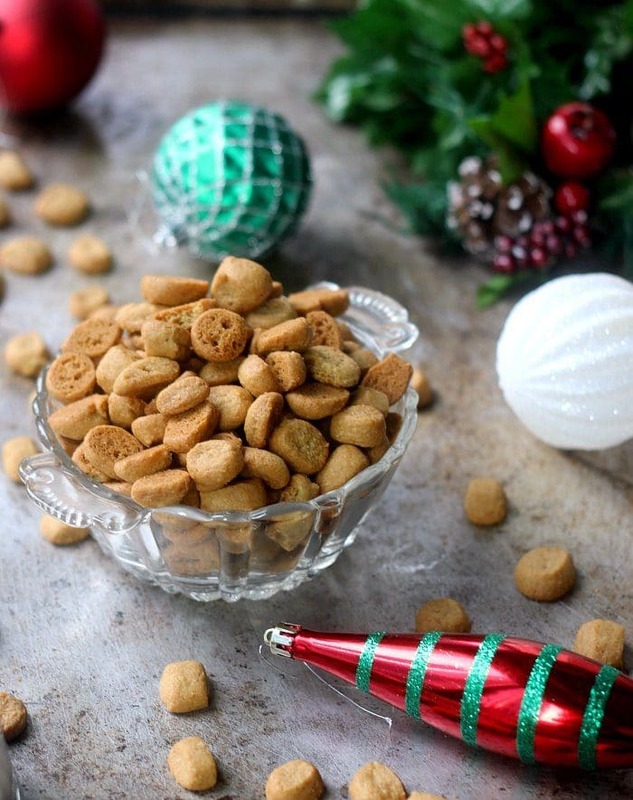 Love hearing your story of your memories of peppernuts! Everyone who had them growing up seems to have such strong memories around them. They can definitely be quite time consuming to make for sure! But I love how it can be a whole family process. Happy holidays to you and your family! Hi Anita! What a great trick! Thank you so much for sharing! cooking these at 250 degrees for the time you call for , 15-17 minutes, gives you a tray of burned cookies. You don’t even cook full sized chocolate cookies much past 12 minutes. I tried 9 minutes and they burned. I turned down the oven to 330 (I have a professional chefs oven – temp is dead on) and cooked for only 7 minutes to dark brown. Hi Caryl! I’m sorry to hear you had difficulties with these cookies burning. I’d love to help troubleshoot since this is a tested recipe. I have made it at least 30 times (I always use oven thermometers) and many other people have also made it with success. When you consider the heat distribution across a tray of 9-12 regular cookies, vs a cookie sheet completely filled with these little cookies, it does make since for the longer time frame to really crisp them up. When you say you have professional chef ovens, do your ovens use a fan? That will definitely affect cook time. Also curious if you by chance are using dark coated baking sheets? I will edit the recipe to give a wider time range so others might check them sooner to make sure they aren’t burning, but I haven’t heard this complaint before from the many others who have also made them. Very sorry to hear you had issues. I hope you at least enjoyed the flavor of those that turned out for you. Our Kansas Mennonite family always used the molasses -anise oil version, baking 400 for 8 minutes. Crisp but not breaking teeth or have to soak in coffee. Yum! They are so good aren’t they?! I made these peppernuts today and plan to make another batch today. Thank you for this great recipe and perfect instructions! The flavor is excellent!! You are so welcome Julie! So glad you enjoyed them! I am from Hutchinson and have wanted to make these for years. I’m definitely making these. I am a Kansas girl… (still here) and grew up with these at Christmas time. My mom would make them and I would eat them by the handful. I don’t make them often, but was thinking about making some for a cookie exchange at work this year. You definitely should! So delicious! Making these with my kids now… I stumbled across this recipe on google, and I got really excited when I saw you were from the Hutchinson area (me too)! So many Hutch people in the comments! I love it so much! What a fun activity to do with your kids. Hi there. I’m from Hutch, too, but now live in the PNW. I did a quick Google search this morn for German Mennonite Peppernuts this morning for the heck of it, and ran into your site. Just finished making my Grandma’s peppernut recipe last night with a friend. “Let’s double the doubled recipe,” she said. “It’ll be fine,” she said. We made 4,066 peppernuts. It took all day. We knew better! Haha, it was great fun. The best batch yet. Hi Maria! Oh my gosh, I bet that did take all day! That is too funny! I just looked at your website and your tiles are beautiful! I read your bio and we have quite similar backgrounds. I have a music therapy degree! anise to flavor through. My grandmother used to put peppernuts into pillowcases and hanging them up to age starting around September. Gallons of pepper nuts were made each year. I only made a half recipe this year and it still took 7 cups of flour. I know that’s not enough pepper nuts for the holiday but it is what it is! You’re right, peppernuts are big down here. Aside from the traditional, my family makes anise-free, chocolate, gumdrop, and pepper as the only spice. There are even peppernut baking contests in the area. Thanks for sharing! This is closest to what my ancestors ( around Yoder, Mennonites) made. Thank you. But, no molasses? I’ve made before and thought I used – may be wrong. These are slightly easier, but I bet close (or exactly like) to what my Aunt always had and gave us some. For a family of 6 kids, we liked these especially since we could get a LOT of cookies. Hi Carol! Many recipes do use molasses, but I do not in mine. The brown sugar adds some molasses flavor which I prefer it to be a litle milder. Yes, these make so many! Great for a big family! Merry Christmas! These are truly addictive! Just brought home a bag from my boyfriend’s parents’ house and I take 1 or 2 out,then immediately open the bag up for another! His parents are from Kansas(now New England transplants), and I’d never had these cookies before, never even heard of them! His aunt back in KS used to mail them out every Xmas, but she’s older now, so his mom made them herself this year. WOW! My favorite cookie! They add chopped nuts and the preserved fruit used for fruit cakes finely diced! Hi Katie! Aren’t they so good? I love introducing people who have never had them to these addictive little things. I’ve never heard of adding dried fruit to them. That sounds delicious! Thank you SO MUCH for explaining these fabulous little cookies!! My mother made these at the holidays my whole growing up years, but when my kids were old enough to eat them, they didn’t care for them and I got out of the habit of making them well, now that I know more about them, I am going to be able to explain what they are, so that my kids will try them (they are no longer “kids”) and I will still make them for myself and friends, regardless! BTW, I use white pepper and cardamom in my recipe and we always made the dough a few weeks before making the cookies, letting the dough “rest” 2-4weeks after we made it. These are DELICIOUS, not to mention addicting. THANK YOU you, again for your history lesson and encouraging information about these amazing cookies. Hi Sue! I’m so glad you enjoyed these cookies! I hope your kids have learned to love them too. If not, more for you! Thank you soooo much for posting this. I just made a new friend who said these were the cookies he missed most from home and I had no idea what they were. The dough is DELICIOUS which pleasantly surprised me as I am not a huge fan of anise. I included it because his mom does. Fingers crossed they’re what he remembers!